Give them Fresh Air. 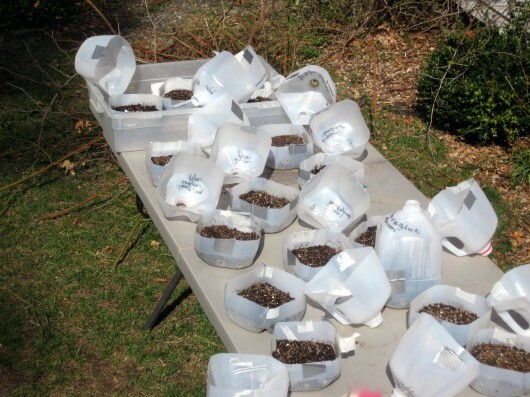 On pleasantly warm days (above 60 degrees), open the hinged top of the milk jug containers, and let the seedlings revel in the fresh, open air. The open top will benefit un-sprouted seeds, too. Remember that sunlight is stronger in spring than in winter, and as a consequence, seeds can bake to death in a closed atmosphere. Replace the tops at dusk. Provide Water. If soil appears dry, provide water. Be sure to water thoroughly but gently, so as not to disturb tender root systems. A watering can with a sprinkling device will suffice. Otherwise, provide water from the bottom, by setting each jug in a large bowl of water. Moisture will be absorbed through the drainage holes. Remember to Fertilize. Unless your seedlings are growing in a potting mixture which already contains food (“Miracle-Gro” is one such mix), fertilize the seedlings. I wait until my seedlings are about an inch tall before providing food. Then I feed them with a 1/4 tsp all-purpose food, dissolved in a gallon of water. Here’s what’s sprouted for me so far: Forget-Me-Nots, French Tarragon, Spinach, Romaine lettuce, Blue Flax, Foxglove, Lupine and Bachelor Buttons. Among my not-yet-sprouted seeds are Primula japonica, Sweet Pea and delphinium. These will probably wait until mid-April to make their appearance. And speaking of delphinium, this beautiful perennial has made a fool out of me every year that I’ve winter-sowed it. I’m fairly certain the seeds must be planted in late-summer or early autumn, when they are still fresh. I look forward to hearing about your winter-sowing updates. Which seeds have sprouted for you so far? I have butternut squash, 6 varieties of tomatoes, cucumbers, chard, and lettuces already sprouting in my basement light racks. More to come! I am SO excited by this process! Thanks for the update sharing how to care for the plants now. Some of mine didn’t work, but the majority did. Right now they look quite health, and I hope that continues and I can plant them. What an easy way to grow seeds! From memory, sweet pea and coleus are two that didn’t do anything (yet?). There may be a few more that I’m not remembering. Only 6 forget-me-nots sprouted…and that’s one of my favorite plants! Quick comment and then back to work for now. Kevin, do not give up on delphinium. On your gentle reminder, I just popped tops of my jugs, and 2 delphinium sprouts are up, just today! Sally forth, keep the faith, they just may sprout for you this year!!! Back with more update post work. :)! sprouted: cosmos, sage, chamomile, broccoli, cilantro, nasturtium. Not sprouted: lavender and delphinium. I should have put a thicker layer of potting mix to start with so that I don’t have to water them every few days. But thanks, Kevin! oh dear! i loved doing this and had great results — but even though i used a sharpie marker all the writing is gone! i have 23 milk jugs of starts that i can’t identify!!! Ruth Wells – Good work! trillium – Be patient with forget me nots — I planted these too, and have noticed more of them sprouting in the jug every day! It’s probably a little early coleus. Sweet pea, however, should emerge soon (if your temps are in the 60s or better). Cary – I shall indeed sally forth and wait on my dear delphinium. David – Congrats! And thanks for the reminder — I need to plant nasturtium. My milk jug report: kale was the first to pop up back in February, then snapdragon, then Cosmos, Morning glory, Moon flower, Zinnia, Tomatilla and Baptisia. Nothing so far in the Passion flower, black petunia or calabrachoa jugs, and no luck so far in a pod from a really neat but unknown variety of blooming tree. This has been a lot of fun and I can’t wait to plant some of this stuff! Thanks for the report, Suzie. Everything you planted is on my “favorite things” list, including Baptisia. There is an i-phone app which will identify a tree if you photograph a leaf. I, unfortunately, do not possess an i-phone! Ooooohhhh…I want an i-phone! Is there anything it WON’T do? So far, I have cosmos, ornamental kale, flax, bachelor buttons, lupines, sweet peas, and a few tiny sprouts of daylilies! I also have MUM sprouts just peeking through the soil – I got the seed from spent flowers other people near my office were throwing away! 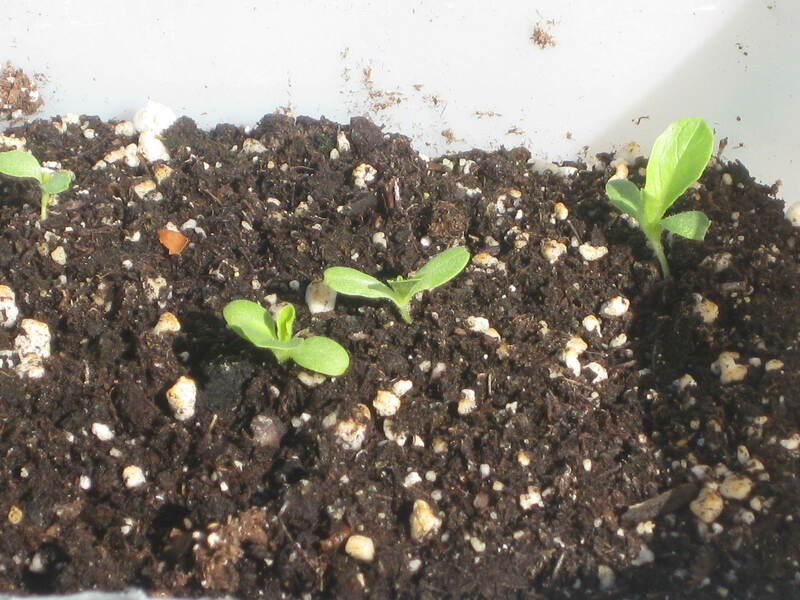 I read that the germination rate was very low – around 2% – for mums from seed, but, I figured, so what? They are FREE. I’ll just sow heavily. Now, it looks like about 30 are sprouting per jug, and I planted 4 jugs! I may never have to buy another mum for fall decorating! Of course, now that I know I can winter sow the seeds, I may be trolling my neighborhood looking for dried seed heads from everyone’s TRASH. : ) So happy…..
Should I be moving my jugs out of the direct sun, do you think? Full sun seems a bit brutal, with our unseasonably warm (hot!) weather. I only can wonder how many winter sowing jugs you have! I imagine a bunch… hee hee! My winter sowing… well, to be frank, isn’t doing well? Well, it’s more about me than the method, I’ve been lax on watering and I started way too late in the season! I’ve only just started seeds in my light setup in the basement! Regardless, back in early January I planted four milk jugs with flower seeds that required a chilling period… but we never got that “chill”. Sadly, the soil mix I used contained some fallen brethern of a ‘Bloomsdale’ spinach that bolted last year – so when I got excited that my seeds had sprouted, I quickly learned that they weren’t the seeds *I* exactly wanted! But I did start up some veggie seeds too! all My summer/winter squash and melons are in the five other jugs I have been saving up – it’s exciting! Now to find a proper watering vessel… I’ve been doing the “dump water in the jug, displace a ton of soil, get angry you just did that” method. Hehehe! Kelli Patton – Will you be my “Mum” buddy? I only ask because I love chrysanthemums, but it seems few others do. In fact, whenever I’ve written about mums, few readers have responded. Nevertheless, they are fantastic plants. I have them in the Serpentine Garden, and what a picture they make from late August through October. A longer-lasting cut flower doesn’t exist. There is a special way to pinch mums so that they become bushy specimens (I described the pinching-technique somewhere on this site). Then you get to divide the plants every spring. Add the seeds you winter-sowed to the divisions you’ll make, and you will soon have a chrysanthemum forest — and then some! Donna B. – Your comment made me smile – the things you described have happened to the best of us! Let me know how your coreopsis, nigella and veggie seeds do — I’ll keep my fingers crossed. I have tomato, cucumber, larkspur, sunflower, stock, cosmos, and a few more. Kevin, I have a question to ask you about the stock flower: I just learned that it’s a cool season flower, and there will be no flower buds growing if the weather is above 60s. The seedlings are now half an inch tall in the milk jug, I plan to transplant them into the ground. But in DC where I live, the temperature is already well above 60s now and will be at least in the 70s, or 80s soon. What will happen to the stocks? Will they bloom at all? Will they bloom in the fall? Yaxue – You are right — stock will only bloom when temperatures are between 60-70, give or take a few degrees. The one year I grew this clove-scented plant, it bloomed beautifully throughout May. It did not produce any flowers in the fall. A good substitute for stock is Nicotiana — its evening scent is divine, and it will not faint in the summer heat/humidity. It blooms and blooms until the first hard frost — which some years for me is late-November. Fantastic plant. Plant the seeds this month or next. I probably need to check again, but so far the only thing I”ve found growing in my winter sowing jugs look suspiciously like careless weeds. All right, then. We are official “mum” buddies! I will check out your pinching technique. I am ashamed to admit that I use a hedge trimmer! Maybe my mums would be more fabulous if I pinched them instead? : ) I also use a hedge trimmer or the weedeater to cut my black eyed susans and zinnias back by a third in the summer. It keeps them bushy and reduces their legginess. No staking! I work long hours, but my heart belongs to my garden. I’ve had to develop “cheater” skills to maintain control! And…how can anyone not love mums?! In my area of the world, they are highly sought after – but everyone treats them as fall annuals, discarding them when they fade. So far I’ve got 24 jugs planted with okra, basil, romaine, dill, butterhead lettuce, 2 kinds of tomatoes, Thai peppers, mini bell peppers, lemon cucumbers, carrots, mustard, 2 kinds of Swiss chard, sage, kale, and sunflowers. It’s only been 2 weeks since I started, so nothing is coming up yet. I’ve been picking up more jugs so I can plant more carrots and lettuce every 2-3 weeks, as well as the additional seeds I keep picking up when I go to the store. I’m an addict! I’ve got another kind of tomato and some gorgeous scarlet nasturteums to plant now. Whenever I get a break in the weather I get out and work in the garden. (Here in Seattle we keep getting snow between rain storms. It’s 10 below normal temp. At least I don’t have to remember to water the jugs!) I’ve got my garlic and onion bed weeded, have started some pots of radishes, and need to plant my sugar snap peas. But I’m still catching up on cleaning up my perennials from last year. Love this idea… planted 16 containers last weekend… I’m in SD so we are still a bit chillie up here. If this works I need a bigger garden… Yikes! I read your piece about winter sowing late so I started my seeds late and as it happened it was two days after I took about 20 milk jugs to our recycling place. I had only few jugs at home so I just planted 8 of them on February 29th. So far there are two kinds of cabbage and beets that are sprouting. I’ll be prepared better next year. This is my first year ever starting any seeds, and I used the WS method. It has been SO exciting! I’ve got sprouts in nearly all of the jugs — spinach, kohlrabi, zinnia, broccoli, jalapeno, yellow bean, basil, and pansy have all come up beautifully. There is one teeny tiny sprout in the marigold jug, and I’m waiting on the lavender and cilantro yet, but those were started late. I’ve been giving them a taste of freedom by opening them during the day, but tomorrow night I might cover them with something more than just their jug covers as we’re supposed to get a pretty good frost. I put my chard, mustard, and spinach into the open garden yesterday and prepped my milk jugs for my warm weather veggies. Those are the ones I’m really excuted about because I’ve never been able to grow them from seed since I don’t have a grow light system. You mentioned Miracle-Gro,did you know Scotts is owned by Monsanto ? I pulled this paragraph off a petition against something they did …..have partnered with Scotts Miracle-Gro, the maker of pesticides, weed killers, and genetically-modified grass seed. The company makes Miracle-Gro and Ortho, while their Roundup brand is marketed in North America and most of Europe by Scotts and owned by Monsanto. This is my 2nd year WS’ing and thanks to the mild winter we had in NY, 82 of my 110 containers have sprouted. I sowed a wide variety of perennial and annual flowers, herbs and veggies. Those that haven’t sprouted yet include, aster, balloon flower, columbine, echinacea, forget-me-nots, hollyhock, red hot poker, penstemon and lupine. All seeds that I received in trade this year so there’s a chance they aren’t viable. LOVE this method for getting lots of new plants for the cost of potting soil! I have tomato, broccoli and basil seedlings up.. They’re still under lights in my basement since we have 8-10 weeks till our last frost free date..
All of my seeds have sprouted. I did them in two batches as they would have taken over my Kitchen. The first round has a variety of lettuces and spinach, as well as snow peas, jalapeno peppers, and Roma tomatoes, basil and oregano. These are already outside in NC and fairing well despite the early season. This round that was planted 2nd includes opal basil, rosemary, thyme, green peppers and a bunch of different flowers from daisys and echinecea, poppies and the like. They need to be a little bit bigger before they go out but all are sprouted! More have sprouted once I opened the tops. Even baby coleus are coming up! After re-reading your instructions, I realized that I have NOT been closing them back up at dusk. I’m wondering if I should separate some of the seedlings as I planted many pretty close together. The cucumber is one example. If you ever feel like tweaking your instructions, perhaps you’d want to mention that it isn’t necessary to use enough duct tape to initially close them that you need super strength to open them back up! I can’t believe how much I used!! I’m so glad that I decided to give this a try, and am eager to see these seedlings planted in their new home, when ready. Just have to add that I love the way baby lupine seedlings look with their distinctive leaf pattern – of course, the same as their more mature ones. But looking at all the shape varieties is so exciting to me. I have spinach and peas and one small lettuce sprout. I planted broccoli, cabbage and cauliflower the last part of February, and they haven’t come up yet. I was late in trying this method with my spinach and lettuce – the other way they all died! So I can not say what is going to happen, I hope they sprout soon! What is sprouting in the “regular” light source way and doing well thus far are the forget-me-nots and the basil. I have to parsely, but not sure if they will make it yet. Oo! My carrots are doing well, I planted the seeds directly in to a tall container, I am very excited about them! I’m glad you posted this… I was wondering! We’ve had the freakishly high temps too. What’s sprouted for me so far is creeping thyme, alyssum, basil, carrots, green onions, one pumpkin (! ), beets, Swiss chard, lettuce. The lettuce was first. I planted 12 jugs in early February and have sprouts of felicia, lupine, statice, poppies, asparagus, and alyssum. My “not yet” list includes pampas grass, cosmos, and 4 o’clocks. I’m planting 15 more jugs this week of annual flowers and veggies. This is my first year to winter sow and it’s been great fun! Thanks for all your instructions. I’ve got a over 75% good luck so far. Some of the seedling that came up shriveled up (damping off? ); maybe I was over zealous with the watering during the heat wave last week in the midwest. Got up to almost 90! But I covered the 16 jugs with light garden cloth to shield them a bit (too lazy to move them all back and forth to the shade. So far good luck with Tuscan kale and broccolini (took a chance and transplanted 6 each in my raised beds yesterday), creeping thyme, lavender ‘Rosea’ (several sprouted, but only one has survived), delphinium ‘pacific giants’, prairie coneflower, shasta daisy, chard (only two), bachelor buttons, parsley, leeks, and a single butterfly weed. Fails so far: red hot poker, Mexican sunflower, nasturtium, artichoke. Well, I started my jugs about a month ago, but so far nothing had germinated. We got 12″ of snow this past week and lows around 20, so maybe it’s been too cold. We will be warming up this coming week so I’m hoping something will start coming up. I’ll wait another week and then I’ll plant again. Some peas and lettuce that I direct sowed in my raised beds are starting to come up which is a good sign. I’m keeping my fingers crossed hoping that the tomatoes and peppers in the jugs will start sprouting soon. I’m in zone 7b, but we have had a really strange winter this year. This is too good of an idea to give up on so I’m going to keep trying. I got a late start when our first attempt at winter sowing my husband’s way failed (seedlings came up great but didn’t get enough light and died. I only had twelve milk jugs. Planted tomatoes and cabbage. The tomatoes, 7 varieties are all doing great! The cabbage, not so good. The milk jugs did have enough weight and the top hole is small enough, drainage holes big enough they survived 3 storms so far that would have killed any hanks. Will probably put in the ground in the garden just after Easter. Used you link to find our new hardiness zone is 7a. I’ve sprouted and now growing in individual 8-oz yogurt cups some Bitter Melons, Long Beans, Shasta Daisies, Calendoras (pot marigolds), Cardoons, California Poppies, Cauliflowers, Leeks, and a packet of “Hummingbird and Butterfly Mix.” Waiting for tomatoes and Chinese Cabbages to make their appearances. Having now read everyone’s response here, I must admit that I didn’t start the sprouts with milk jugs, but simply put the seeds in between two layers of wet paper towels and sealed in zip-lock bags marked with permanent ink to identify them. Once they sprouted, I moved each sprout (good use of chopsticks here!) into each of the “cups” of recycled egg cartoons filled with potting soil and soaked with water. Once the seedlings are 1-2 inch (and second pair of leaves appeared), I moved them into individual 8-oz yogurt cups by simply leveling off the top and tearing off the bottom, leaving the rounded egg-cup sides intact. This way I don’t disturb the their root systems and the seedlings are allowed to grow in the yogurt cups until it’s warm enough to transplant them outside. Thanks for the spelling of calendula, Ian. I knew it didn’t look right, but wasn’t sure how. So far this has been my best experience with growing from seed. Everything (with the exception of my chives, from last years seeds) has begun to come up. Even seeds I only planted on 3/11! I have already had to transplant my Snow peas and my Sugar snaps as they had actually formed “runners” out the top of the jug, and I only started this entire project on the 1st of March, Wow! I have collards, kale, spinach, beets, basil, cilantro, parsley and sunflowers (these may have been too early) growing quite nicely. I replanted my first 2 jugs, that housed the peas, with tomato seeds last Thursday, perhaps a little early too but it has been very warm lately and I couldn’t resist. But I went one step further and placed paper dixie cups (with a couple of holes poked in the bottom for drainage) in the jugs, planted the seeds, and am now waiting for them to grow. Then, when they are ready to transplant, I will simply plant cup and all into the prepared spot. I already have tomatoes sprouting from an the 3/11 planting. I can’t imagine growing stuff any other way from here on out. I also have direct sown some Mesclun, micro-greens and radishes into my container garden. I have strawberries blooming in the pots from last year. I can’t remember being this excited about my gardening. I have been telling everyone about this adventure, I am sure they wish I would just shut up! I already have plans to turn more of the yard into a “food growing mecca”. I keep finding techniques I want to try. Hubby just shakes his head, but hey, less for him to mow, right?! No problem, KokHeong! Interesting technique you describe, and I like the use of chopsticks! I used the jug method and so far I have tomatoes coming up. None of my peppers have come up. Do pepper plants take longe to germinate than tomatoes? Everything I had sown came up except for the moonflowers. I have mesclun, coriander, tomatoes and peppers. Of course the 70-80 degree temps have spurred them on further. The peppers were a little slower to cooperate but are on their way now. So it’s cold again with snow on the ground in Buffalo, NY. Do I take the jugs with new sprouts inside? There is a very unique looking, non-weed-type of tiny seedling in the jug labeled pearlescent pink fragrant Rhodendron, but I have not confirmed it yet. Redbud Tree, ‘Tower Blue’ Columbines (triples), Bottle Gentian, Cimicifuga ‘Brunette’, Aster ‘Blue Star’, Ligularia ‘Desdemona’, Chelone (Turtlehead), unnamed pink Clematis, ‘Autumn Clematis’, Tiarrella. The Redbud tree I sprouted in a jug in 2011, overwintered in my “hospital bed” for plants needing acute attention, is leafing out successfully. It’s about 7″ tall now. Its Mommy is blooming gloriously as we speak. Winter-sowing adds such an entertaining dimension to gardening in the off season! Thanks, Kevin, for continuing to highlight it and provide guidance. Would this work just as well with opaque milk jugs? Most of the ones I buy are either opaque white or yellow like Mayfield jugs; yours appear mostly translucent. Elaine, I am right there with you!!! I too, used a sharpie & the rain washed it away, but I have sprouts!! I love this method! Pam – Only tender annuals (if already sprouted) need to be protected from the cold. Don’t bring them into your warm house, but place them instead in an unheated (or barely heated) garage. Or simply throw a blanket over the containers when temps are near freezing. When overnight temps dipped into the teens here recently, I simply moved the sprouted annuals into my unheated mud-room for the night. They returned outdoors the next day, when temperatures neared 40 degrees. Riversana – If light can not penetrate the jugs you described, don’t use them for winter-sowing. Use clear soda bottles instead. Elaine and Kim – Could the sun be so incredibly intense that it bleached out your labels? In any event, once your sprouts attain their first set of true leaves, try Googling “seedling ID”. Then you can re-label your containers. A paint-pen, which is even more durable than a Sharpie, might be in order! I also threw a blanket over the ones at home. But it turns out the little sprouts are stronger than I thought and even the uncovered ones were fine. Lissa – Congratulations on your winter-sowing success. The seedlings are pretty tough, huh? Mine endured below-freezing temps last night, and on inspection this morning, not one of them looks any worse for the wear! also have you saved to fav to see new things on your website.